Less than two months before voters begin the process of choosing the next U.S. president, real estate mogul Donald Trump has widened his lead among Republican White House contenders, according to a new nationwide poll by Quinnipiac University. Trump has 27 percent support in the latest survey, well ahead of Florida Senator Marco Rubio at 17 percent, and Ben Carson and Texas Senator Ted Cruz, each with 16 percent. Carson’s support dropped seven points from last month’s poll. Former Florida governor Jeb Bush, once the odds-on favorite to win the nomination, languishes well behind at 5 percent. 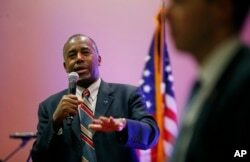 Republican presidential candidate, Dr. Ben Carson speaks at a rally in Pahrump, Nevada, Nov. 23, 2015. Trump’s continued surge comes less than two weeks before the fifth Republican presidential debate, in Las Vegas, Nevada. The debate looms as a crucial test for Trump’s rivals, who so far have had little success in denting his momentum — either nationally or in the key early voting states of Iowa and New Hampshire. Iowa begins the process on February 1 and the New Hampshire primary follows eight days later. 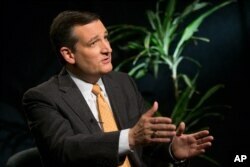 Republican presidential candidate Sen. Ted Cruz, speaks during an interview with The Associated Press in Washington, Dec. 1, 2015. Despite his success in the polls, Trump finds himself increasingly on the defensive and the subject of greater scrutiny. This is particularly true after continuing to insist that Muslims celebrated the 9/11 attacks in New Jersey, even though no credible evidence has come to light. “I said very strongly and very correctly, I said there are people over there and they were dancing in the street and they were dancing on rooftops,” Trump told supporters recently at a rally in Myrtle Beach, South Carolina. Past attempts to challenge Trump have not worked out for many of his rivals; during a campaign stop in New Hampshire, however, New Jersey Governor Chris Christie saw an opening with Trump’s claim. “It didn’t happen and you know, the fact is, people can say anything, but the facts are the facts and that did not happen in New Jersey that day and hasn’t happened since,” Christie told reporters. Trump refused to back down, and he said hundreds of people had called or tweeted confirming his recollection. “You know what, there is nothing wrong with an apology, but you have to be wrong. I believe in apologizing, but you have to be wrong,” Trump told supporters in South Carolina. Jeb Bush also has intensified his criticism of Trump in recent weeks. Bush told an audience of Republican activists in Florida that he represents a different approach to governing. “If you want a talker, maybe I’m not the guy; but if you want a doer, someone who’s done it, someone who’s taken on the tough challenges, I am your candidate,” said Bush, who continues to struggle in single digits in many polls. 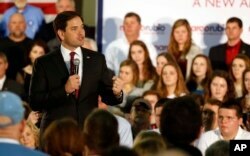 Republican president candidate Sen. Marco Rubio, speaks to supporters at the Guntersville Civic Center in Guntersville, Alabama, Dec. 1, 2015. So far, the renewed scrutiny on Trump’s claims and angry rhetoric does not seem to be having much impact on his supporters, who are angry with and disappointed in Washington. “People are frustrated with the inability of government to get things done. They are anxious about the future. They are fearful about overseas threats,” said scholar Bill Galston of the Brookings Institution. Trump’s rhetoric and aggressive style have set him apart from the rest of the Republican field for months, beginning with his opposition to illegal immigration and his pledge to build a wall along the border with Mexico. Analysts say Trump also has hit a broader chord, though, that is resonating with Republican primary voters. “It’s partly because he puts himself out there as a kind of truth-teller against all those who are politically correct or wishy-washy, and that gets you a good slice of the Republican vote,” said John Fortier, an analyst at the Bipartisan Policy Center in Washington. Trump’s staying power has surprised many political pundits who predicted his campaign would self-destruct earlier this year. Many analysts continue to insist it is unlikely Trump will wind up winning the Republican nomination next year. So far, it remains unclear who from the crowded Republican field will assume the risk of taking on Trump directly. The next best opportunity for that comes in the December 15 debate in Las Vegas, perhaps the last chance for Republican contenders to make their pitch to the public before Americans turn their focus to the Christmas and New Year’s holiday period.